This can be due to a number of pathological processes. This is the term applied to generalized, age-related arterialchanges, which are exaggerated in hypertension. In arteries down to 1 mm in diameter these changes initially take the form of compensatory muscular hypertrophy of the media, which is followed by fibrosis and dilatation of the lumen. In hypertensive vessels of this size, atheroma is often superadded. Smaller arteries show different changes that are usually most marked in the viscera, especially in the kidneys. Here, though there is medial hypertrophy, the predominant change is intimal thickening by concentric layers of connective tissue, with luminal narrowing. Arterioles undergo hyaline thickening of their walls and luminal narrowing. The narrowing of small vessels in the kidney owing to hypertension causes renal ischaemia, which further promotes hypertension. 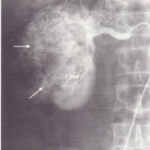 In malignant hypertension, arterioles also show fibrinoid necrosis of their walls. This is a degenerative disease of unknown cause, characterized by dystrophic calcification of the media. It is especially common in the major lower limb arteries of the elderly, and there is an increased incidence of this degeneration in diabetics. Cystic medial necrosis or degeneration This describes mucoid degeneration of the collagen and elastic tissue of the media, often with cystic changes. It occurs mainly in elderly hypertensives. Dissecting aneurysms of the thoracic aorta are often due to this process. Cystic medial degeneration also occurs in inherited defects of collagen tissue formation (e.g. Marfan’s syndrome, Ehlers-Danlos syndrome), again resulting in dissecting aneurysms . The pathogenesis of this condition is described. The different vessels which may be involved are shown. Atheroma seldom involves arteries of less than 2 mm in diameter. Most arterial disease is due to atheromatous degeneration. This is due to atheromatous disease involving the aorta, iliac and/or any other peripheral vessels. It consequently occurs over the age of 50 years, chiefly in men who are smokers. Both limbs are often affected, but usually one is more severely affected than the other. X- RAY S may show calcification of the arteries of the leg. 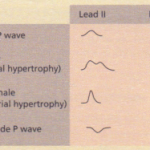 DOPPLER ULTRASOUND defines the severity of the lesion. atherosclerosis in order of frequency. AORTOGRAPHY by direct injection of contrast medium into the aorta is used. Angiography is also performed via a percutaneous catheter inserted into the brachial artery and digital vascular imaging with an intravenous injection has been used. These investigations show narrowing and stenosis of the arteries. RISK FACTORS should be reduced (e.g. smoking should be stopped, diabetes and hypertension should be treated, and weight should be reduced). THE LIMBS should be kept warm but local heat should not be applied. FEET. Care should be taken to avoid infection and trauma of the feet. Elderly patients often need regular visits to a chiropodist. REGULAR EXERCISE should be taken to encourage the development of anastomotic vessels. LOW-DOSE ASPIRIN should be given. VASODILATORS should not be used. ANTICOAGULANTS are of no benefit. TIMING. Surgery should not be considered for 3 months after symptoms have developed, to allow time for collaterals to develop. In 75% of patients the disease remains static. AORTO-ILIAC BYPASS grafts give good results, but reconstructive surgery for blockages below the inguinal ligament is less successful. BALLOON DILATATION via a catheter inserted into the artery is useful for local iliac or femoral stenoses. AMPUTATION is necessary for severely ischaemic limbs, usually those with gangrene. Rehabilitation may take months in the elderly and is often unsuccessful. Many of the patients have generalized atheromatous conditions, so that the overall prognosis often dictates the outcome of localized disease; many die from a myocardial infarction. Like chronic ischaemia of the legs, this is mainly due to atheromatous disease with thrombosis, but it can also occur owing to embolism from the heart (e.g. in atrial fibrillation) or from an atheromatous central vessel. The clinical picture is of an acutely painful, pale, paralysed, pulseless limb. Treatment is surgical, with removal of the clot. If gangrene develops, amputation is necessary. The commonest aortic aneurysms are abdominal. These are usually due to atheroma. Asymptomatic aneurysms may be found as a pulsatile mass on examination or as calcification on an X-ray. A CT scan or ultrasound of the abdomen will demonstrate the size of the aneurysm, the thickness of the aortic wall and whether any leak has occurred. An expanding aneurysm may cause epigastric or back pain. Rupture presents with epigastric pain radiating through to the back. A pulsatile mass is felt and the patient is shocked. Treatment of symptomatic aneurysms is surgical. A ruptured aneurysm requires emergency surgery, but even then the mortality is high. Large, asymptomatic aneurysms should also be treated surgically (except in the very old) because those larger than 5 em in diameter have a high risk of rupture. Follow- up with ultrasound is required with small aneurysms and surgery offered when aneurysm reaches 5 cm. Most thoracic aneurysms in the past were due to syphilis, but now many are due to atheromatous disease. The aneurysms may affect all parts of the thoracic aorta-the ascending aorta, the arch and the descending aorta. Most are asymptomatic, but when large they can give rise to chest pain or to evidence of pressure on other organs, such as the superior vena cava or the oesophagus. They can rupture. 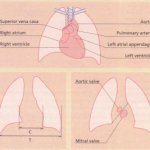 In the majority of cases, the dissection starts in the ascending aorta. Pain, which is severe and central, often radiating to the back, is the major symptom. The pain radiates down the arms and into the neck and can be difficult to distinguish from myocardial infarction. On examination, the patient is usually shocked and there may be neurological signs owing to the involvement of the spinal vessels. The peripheral pulses may be absent, but this is not invariable. The diagnosis is suggested by the presence of back pain with no ECG or enzyme changes of myocardial infarction. The chest X-ray may show a wide mediastinum and CT scanning and ultrasonography with transoesophageal echocardiography if available are diagnostic. Aortography is now rarely necessary to confirm the diagnosis. Half of the patients are hypertensive and this should be controlled immediately. Emergency surgery is necessary for many dissections. There is an increased risk of dissection in pregnancy. Patients with Marfan’s syndrome are at particular risk of dissection originating at the root of the aorta. Risk can be assessed by measuring the dimension of the aortic root using serial echocardiography. Elective repair of the aneurysmal aortic root is indicated if the dimensions increase rapidly.